Hey, “Back To The Future” Fans! Wanna See Something Cool? This is of course a reference to Back to the Future, and nerds like myself went crazy with speculation. The trilogy hit BluRay last fall, so what could this mean? A theatrical re-release? A sequel? A remake? Yep. Ladies and gentleman, the Nike Mags from Back to the Future 2, those awesome sneakers that lace themselves, have become a reality. Now all we need is for them to finally release the hoverboard. *Geeze, I’m having a hard enough time explaining what an entertainment blogger is to people. Imagine the blank stares those guys get? There are currently 1 Comment on Hey, “Back To The Future” Fans! Wanna See Something Cool?. Perhaps you would like to add one of your own? You so scared me there! My jaw hit the floor at the mention of ::shudder:: Remake aaaaaah! But the shoes! Oh the shoes! Technically by the movie’s timeline, we’re about 4 years from the Hoverboard. eek! 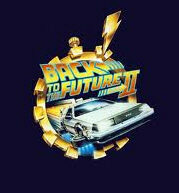 Movie Vine / Movies / Hey, “Back To The Future” Fans! Wanna See Something Cool?